Here’s something a little different for your Sunday lunch next week. 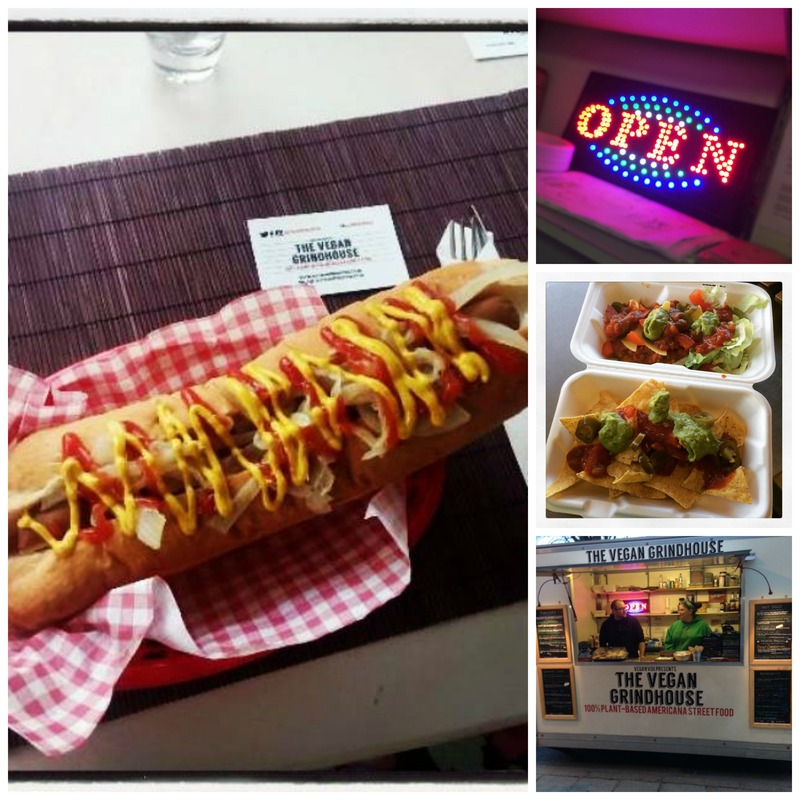 Kings Heath’s Brum Yum Yum has teamed up with The Vegan Grindhouse to launch Birmingham’s first ever meat-free street food market. 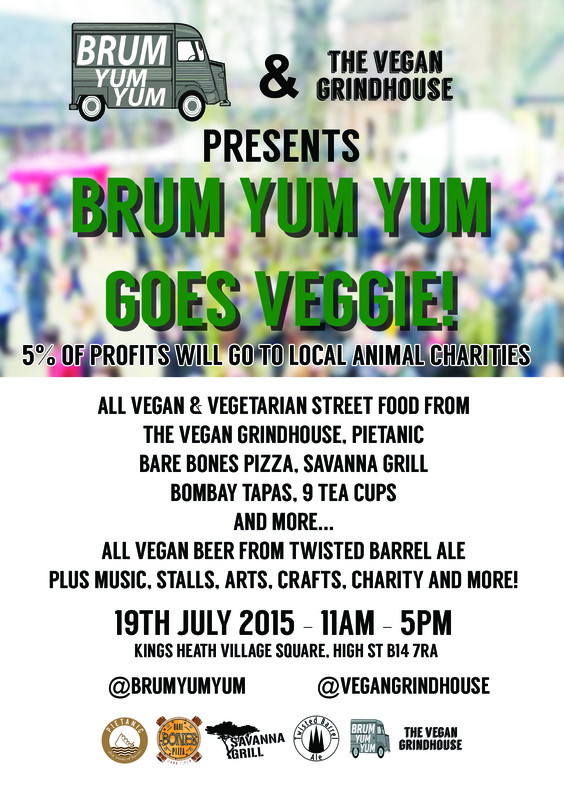 ‘Brum Yum Yum Goes Veggie’ on Sunday 19th July at Kings Heath Village Square, from 11am-5pm, will feature Birmingham’s leading street food chefs showcasing an entirely vegetarian menu with vegan options available on each stall. You’ll recognise The Vegan Grindhouse from Eat Street in Leamington, 1st Thursdays in Rugby and Digbeth Dining Club in Brum. Husband and wife team Andy and Lisa travel the Midlands in their truck ‘Artie’, serving Americana street food and desserts. Think an American 1950s style diner, with gourmet hot dogs, chilli dogs, gourmet burgers, nachos, shakes, cookies and ice cream but without the guilty conscience. 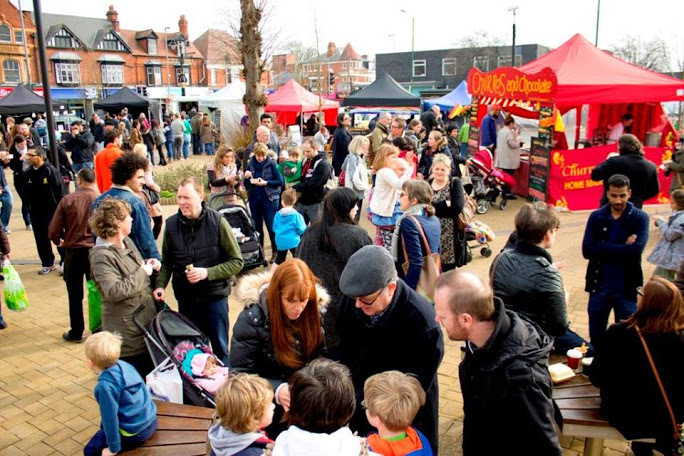 In addition to street food, the event will showcase local musicians, Twisted Barrel Ales from Coventry along with organic fruit and vegetables, crafts, cruelty-free skincare, cakes and a juice bar. Back at Eat Street food market in Leamington Spa for Halloween, I met the lovely Jeremy and Tina Stone from Mama Eti’s. 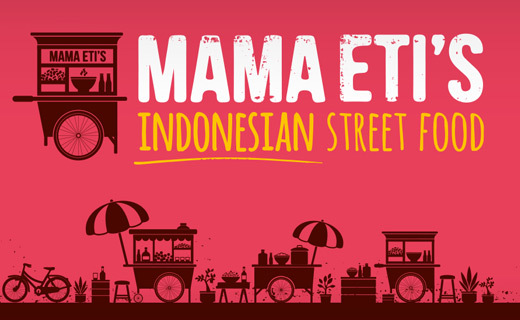 Mama Eti’s is a new Indonesian street food brand. Like many people I guess I wouldn’t be able to tell the difference between Malaysian and Indonesian food when presented with dishes, so it was great to learn about the cuisine from the couple. Jeremy lived and worked in SE Asia for ten years where he met his wife, Tintin (Tina) in Jakarta and moved back to the UK in 2009 to settle in Bournville. 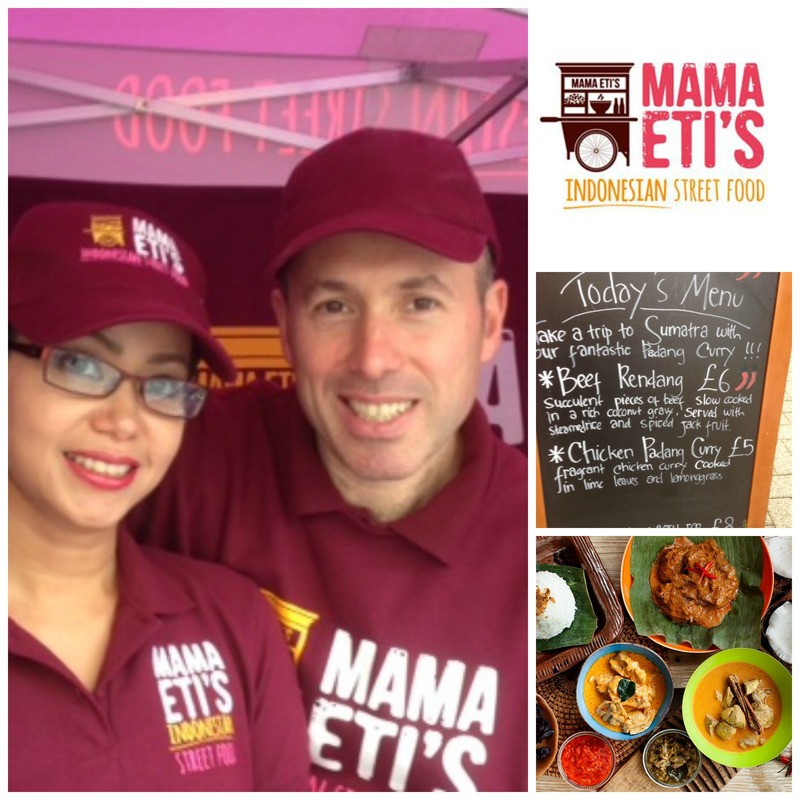 Jeremy says; “We have set up Mama Eti’s to fulfil our passion for Indonesian cuisine and street food. It’s the influences from China, India, the Middle East and Europe that make Indonesian food so diverse and delicious. Soto Ayam (fragrant lemon grass and chicken broth with rice noodles, fried soya beans and crunchy vegetables). Mie Pangsit (steamed egg noodles served with chicken cooked in ginger and other spices, steamed pak choi and a crispy fried wonton). Mie Aceh (a very soupy and rich Sumatran curried egg noodle dish with minced lamb, bean sprouts cooked with spices such as star anise, cinnamon, cardamon). Satay (chicken, beef and lamb satay served with our own satay sauce, Indonesian pickle and rice). Ayam Penyet (chicken cooked in spices and then deep fried served with rice, deep fried tofu and Indonesian sambal). Nasi Goreng (fried rice with chicken and vegetables served with a prawn cracker and Indonesian pickle). Tahu Sumedang (from Tina’s home town, deep fried cubes of tofu served with Indonesian sambal). On the menu at Eat Street were Beef Rendang (a very rich and succulent slow cooked Sumatran beef curry cooked in coconut milk and spices served with cassava leaf curry, coconut rice and Indonesian sambal) and Ayam Padang (a Sumatran chicken curry cooked in coconut milk with lemon grass, galangal and other spices served with coconut rice and Indonesian Sambal). 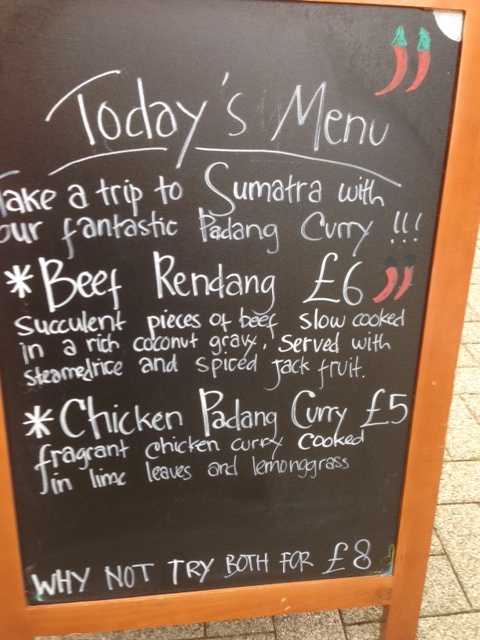 I tried the chicken padang, the delicious, succulent chicken had been marinated overnight and just melted in my mouth! Mama Eti’s went to their first food festival in July, which they followed by appearing at Brum Yum Yum in Kings Heath, the Sketts fine food market in Solihull and Eat Street in Leamington Spa. 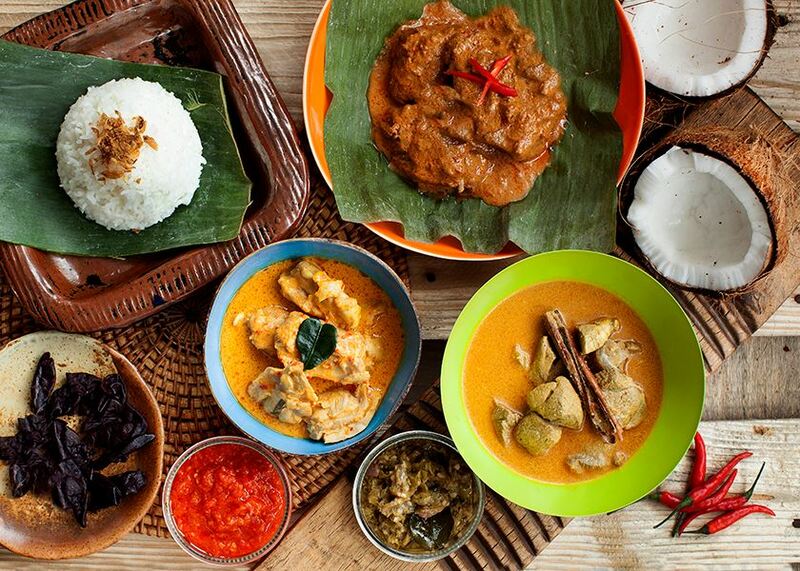 As they find their feet, receive customer feedback on dishes and develop their offer, the Stones have lots of ideas to raise the profile of Indonesian cuisine. Plans to bottle their sauces and even make Indonesian food kits are already in the pipeline. Before they take a break for Christmas, you can find them at the Stourbridge Christmas Lights switch on Saturday 29 November. For their great quality food, value for money and pretty gardens, here are my top five recommendations for summer lunches – The Bluebell in Henley in Arden, Anderson’s at The Bulls Head, Brum Yum Yum, Warwick Street Kitchen and The Cross in Kenilworth. 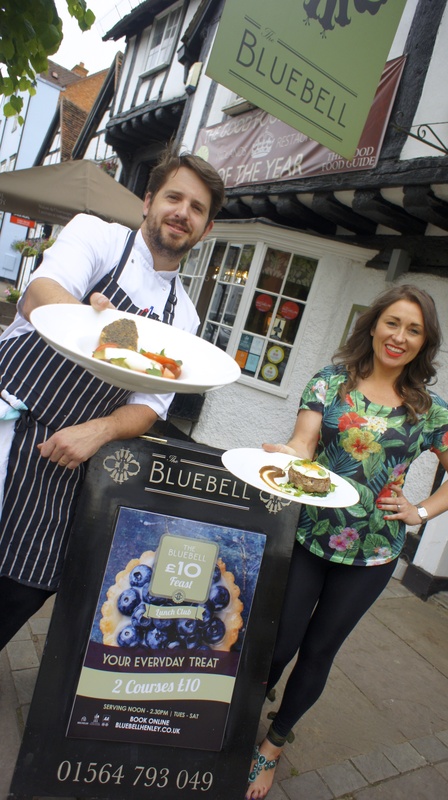 1 – For value for money, The Bluebell in Henley in Arden tops the list for offering two courses of two rosette rated food for £10 in their Feast Lunch Club. From Tuesday to Saturday, noon to 2.30pm, the daily changing menu has so far included treats such as sweetcorn and basil velouté, salt beef hash and banana pavlova. 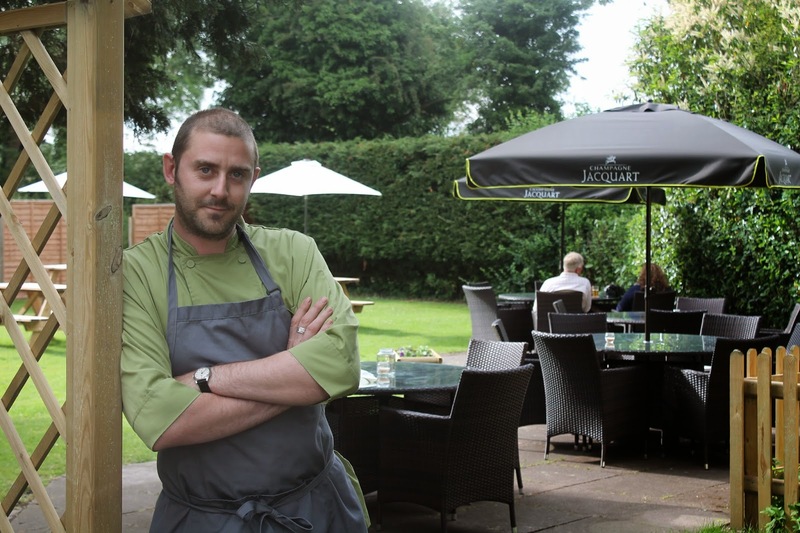 2 – Just a bit further down the road, Anderson’s at The Bulls Head in Wootton Wawen has unveiled their new dining garden. If you’re going to eat al fresco you want to enjoy your surroundings, so check out the extension to the main restaurant, where diners can order off the a la carte menu featuring their popular steaks and grills. 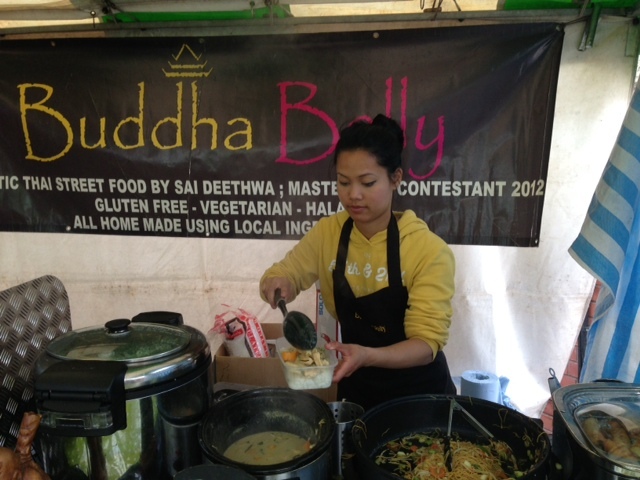 3 – You’ve got until 1 August to try Brum Yum Yum Lunchmarket. Running through the summer into August, the city centre square bursts into life with the delicious aromas of street food, there’s also a beer market and live music if you don’t have to go back to the office! 4 – Finding a good readymade picnic hamper is as rare as hen’s teeth. I find that either you are overcharged for the amount of food contained, or you have a range of items that you wouldn’t have chosen yourself. So hats off to Warwick Street Kitchen in Leamington Spa. 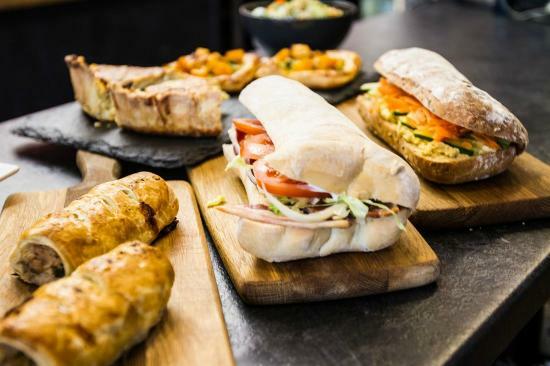 Their £20 picnic for two is packed with charcuterie, hummus, salad, anti pasti, bread and flapjack bites. You can even borrow a basket and blanket to take with you to nearby Jephson Gardens. 5 – The Cross in Kenilworth has launched a new garden menu, featuring classics such as burgers and fish and chips which are cooked and eaten in (you guessed it) their garden! 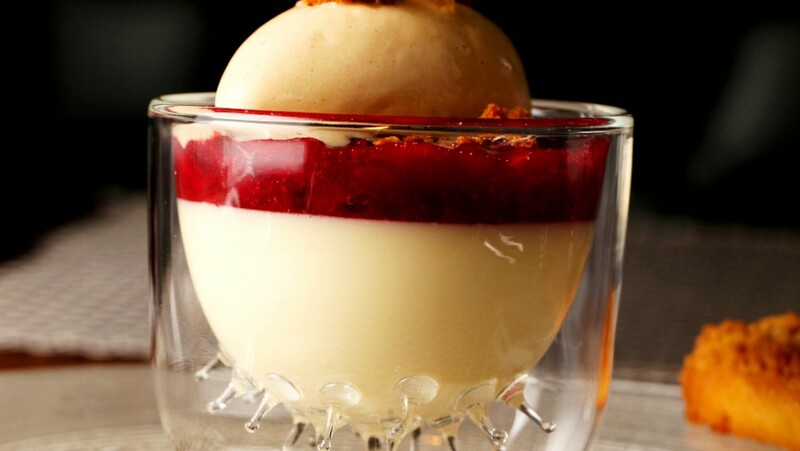 If you ‘re not so lucky with the weather, heading indoors to sample Adam Bennett’s cooking isn’t a hardship with dishes such as corn fed poussin and strawberry sundae on the fixed price lunch menu. 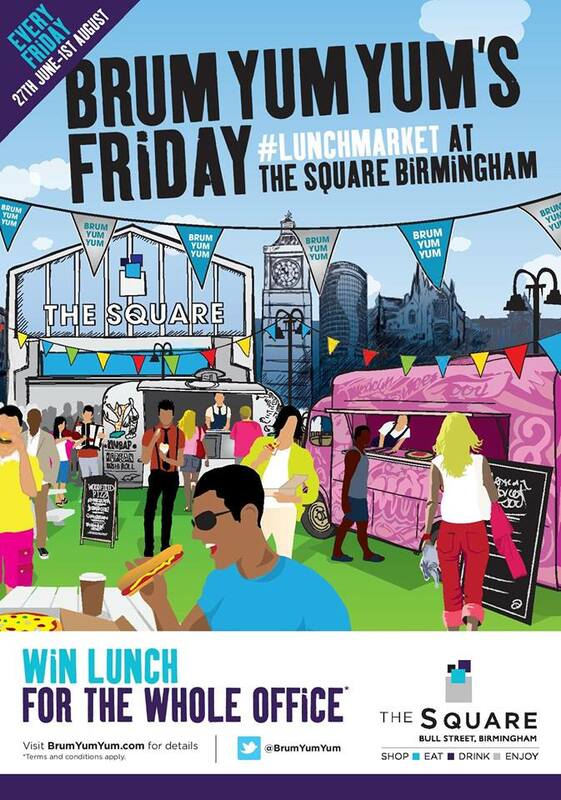 Today is the launch of #LUNCHMARKET at The Square, Bull Street, Birmingham so that’s where the delicious smells of pulled pork, tacos and jerk chicken are coming from. This is another first for the city, brought to you by Duncan Stanley of Brum Yum Yum street food market in Kings Heath. The lineup for the first event features @TheMexicanBean1@ricopizzashack@63_Islands@vegangrindhouse#BaileysCarribeanBBQ and the chance to win lunch for the whole office! The event will also feature #BEERMARKET a pop up beer and Prosecco bar. 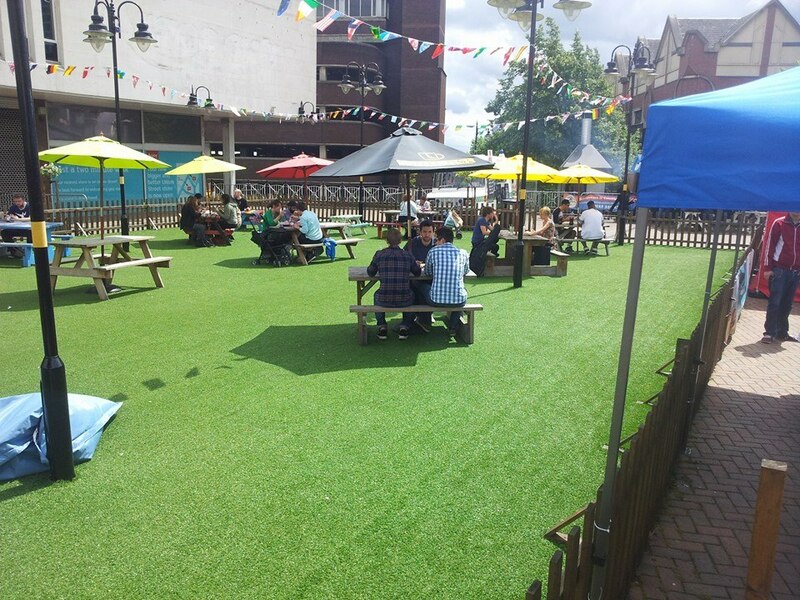 Every Friday until 1 August, Lunchmarket is a great start to the weekend with street food, drinks and live music in the open air in Birmingham city centre. So here are my top picks for food and drink events in the Midlands this month. Kicking off with a World Cup themed cheese and wine party in Birmingham Library, take a peek behind the scenes at a local farm during Open Farm Sunday this weekend. Next week two major events take over Birmingham for the weekend, the BBC Good Food Show rolls into the NEC while the new Birmingham Wine Festival sets up camp at the Hyatt hotel. Fingers crossed for sunshine for Mallory Court’s Garden Lunch and Piccolino’s Royal Ascot Ladies Day lunch in aid of Cure Leukemia. Adams restaurant has a very special champagne lunch in the diary for 24 & 25 June (more of that later) while our Brum Yum Yum friends take over The Square for a Friday lunch market. Details of all these jumpin June events can be found on the events page. Brum Yum Yum, the team behind the hugely popular KingshEATh Streetfood Market, are set to transform lunchtimes in Birmingham’s city centre with a weekly serving of streetfood and music as they launch #StreetfoodSocial on Friday. 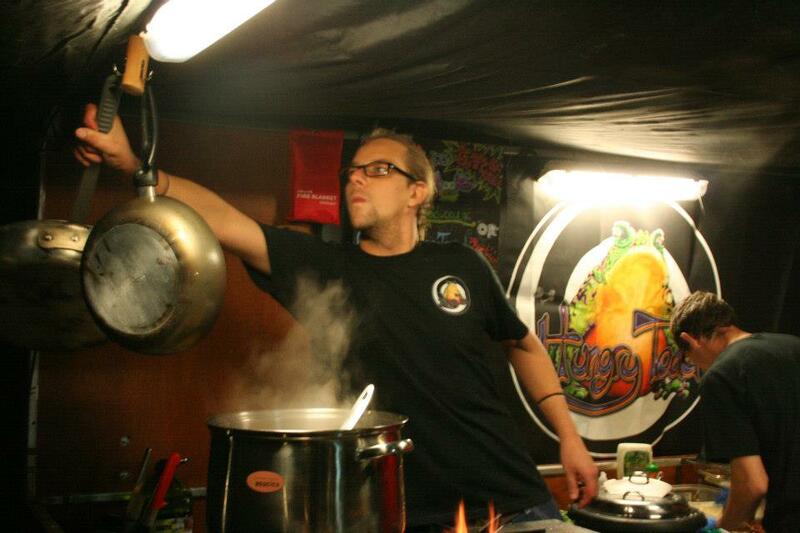 #StreetfoodSocial will bring together a selection of the Midlands’ most popular street-chefs. Highlights for the launch weekend include pulled pork and chilli brisket, home-smoked and slow-cooked for hours and hours; Thai fishcake, handmade to order by a Masterchef contestant and fresh Belgian waffles, all hot and fluffy, served from a vintage caravan. Most dishes are in the £3-£ 5 range with plenty of snacks and sharing plates on the menus. 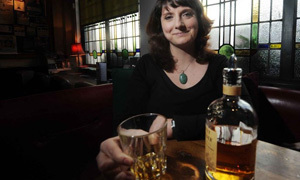 Brum Yum Yum founder Duncan Stanley said “Forget about pseudo sandwiches and plastic pub grub. Now there’s a better way to eat well, have some fun and get that Friday feeling started #StreetfoodSocial style! 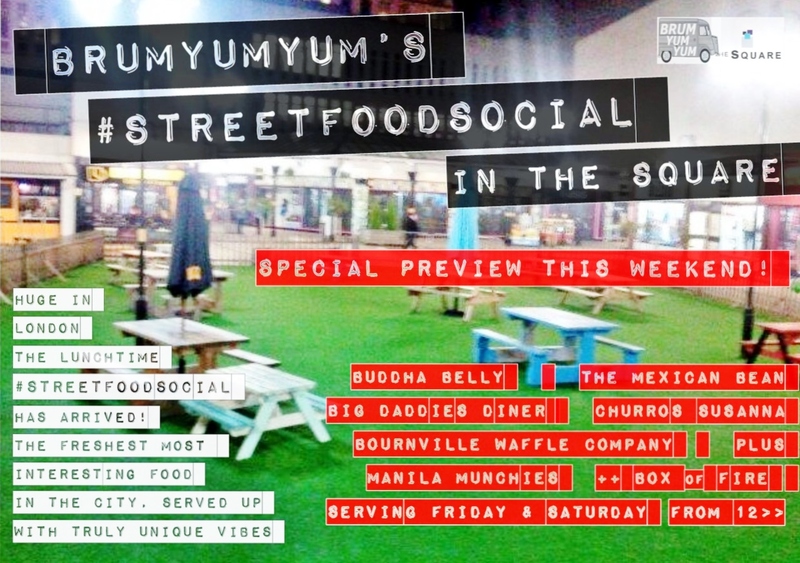 As a launch weekend special, #StreetfoodSocial will take place on both Friday and Saturday from noon to 5pm. So if you love great food and nice vibes, bring colleagues and friends along this weekend and join Birmingham’s first ever #StreetfoodSocial. See @brumyumyum and www.brumyumyum.com for updates. 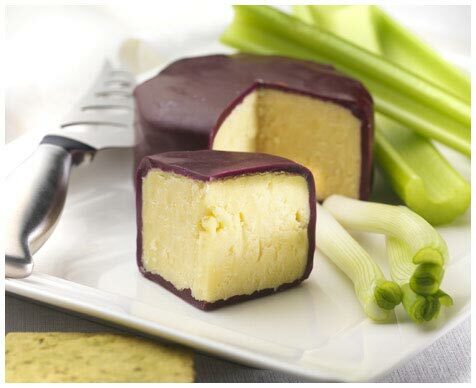 It’s a busy week ahead for foodies in Birmingham – a cheese and wine tasting with Amy Seton from The Whisky Miss, the opening night for pop-up bar Nörjske, a beer tasting at Café Blend and a new city centre location for Brum Yum Yum in Priory Square. On Saturday I’ll be joining fellow food bloggers Dine Birmingham, Gingey Bites, Glamour in the County and Jo’s Kitchen in Kings Heath for Birmingham’s first street food market. 15 of the country’s hottest street food traders will be cooking to a background of music and an urban circus troupe. With dishes from £3 – £5, we’ll be grazing on a menu of dry aged Hereford beef burgers,10 hour roast Cotswold lamb, South Indian pure vegetarian masala dosa, handmade Moroccan falafel and hummus, Middle Eastern salads and hot Belgian waffles. Doesn’t that make your mouth water! I’ll tweet photos as we’re there @midlandsgourmet.